Well, it wasn't the Phish reunion anybody was expecting, but that's the Phish way: Trey Anastasio, Mike Gordon, Page McConnell and Jon Fishman performed together for the first time in more than four years Saturday night (Sept. 6) at the New York wedding of former road manager Brad Sands. According to witnesses, with no prodding or announcement, Phish simply got up and performed three numbers, Suzy Greenberg, Julius and Waste for the presumably stunned wedding guests. The wedding performance is already fueling rumors about the band's inevitable reunion, especially after Trey Anastasio's recent comments saying,"I would give my left nut to play [Phish's You Enjoy Myself] five times in a row every day until I die." Plus, Mike Gordon revealed that the band has been getting dinner together and even held a meeting with Billy Breathes producer Steve Lillywhite. 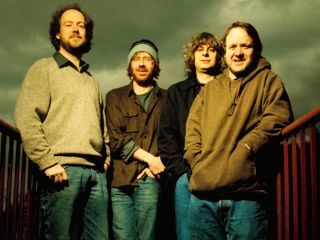 And then there was Phish's near-reunion last July at the Rothbury Festival in Michigan. It's all adding up to something. Check out this video from the wedding of the sharp-dressed Phisherman playing Julius.